Lynn Hazan of Lynn Hazan & Associates challenged NFPW members to tell their story in six words. So can you tell your career neatly in six words? Most participants who shared their attempts did not delve deep enough, Lynn noted. Their words could apply to anyone in the room. “How do you market yourself and create demand for yourself?” Lynn asked. She challenged each audience member to continue working on their story and then turn it into a 30- or 60-second elevator pitch. The exercise also paves the way for development of a Unique Positioning Statement, which Lynn recommended using for the summary statement on a resume. To learn more about communications stepping stones, check out Lynn’s slideshow on the topic. Is finding a source through Facebook unethical? 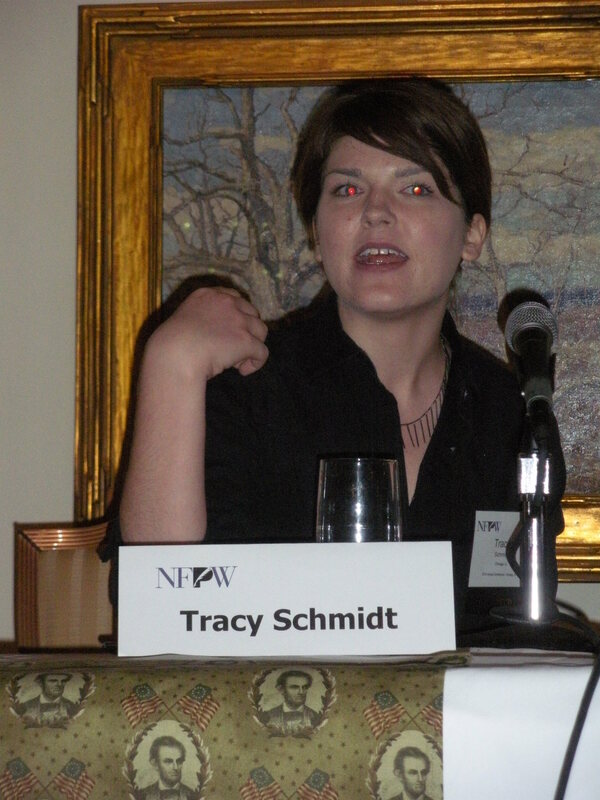 Tracy Schmidt, editorial director of ChicagoNow, doesn’t think so. Previously she was a reporter for Time Magazine, reporting on Facebook. She also covered the Virginia Tech shootings. Through Facebook she found a student who had been in one of the classrooms, and she got her interview. Today she is part of ChicagoNow, a network of more than 300 local blogs. She developed its concept and managed its launch in August 2009. She joined the Tribune in 2008 as a reporter at Triblocal, a reverse-published, hyper-local newspaper group. “We take the best online content and fact check it and then we put it in a paper and include it in the Tribune,” she explained. Chicago Now bloggers post more than 100 entries to the site each day about local topics, Tracy said. Then Chicagoans begin commenting. “The result is a lively, authentic conversation about all things Chicago,” according to the ChicagoNow website.